This is our story. 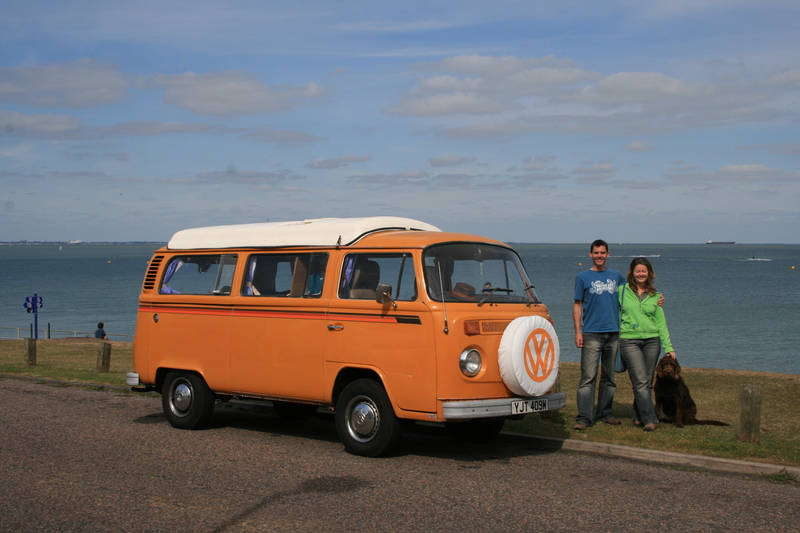 Paul (that’s me), Sarah (the wife and go getter), Conker (the dog) and the Bus (name TBC). Christmas. 2008. Sarah bought me a Volkswagon Campervan. A Splitty no less! Olive green – not quite Hibs’ colours but close. It looked brand new – not a scratch on it. No rust either and a shiny new interior. But it did have stickers on the windows. Of people. Two people in fact. A driver and passenger. They looked happy. So was I. It only had two gears though. One forward and one reverse. Steering was a bit dodgy. Pulled quite a lot to the right. It went though. Round the kitchen, under the dining table chairs, back across the kitchen…. into Conker’s mouth. I’d only had it ten minutes and already it had dents in it. Dog teeth dents. Fortunately the passengers were OK. Well they would be given they were only stickers. This was the answer to the so called mid-life crisis fantasy of owing a VW campervan. Not quite the real thing but then the real thing was a fantasy wasn’t it? July. 2009. Sarah likes to email the fruits of her internet surfing at pace – link after link with questions like “What about this one? We could buy this one”, or “what about this one? This one’s got purple seats and polka dot curtains…” After a while I got this feeling that we’d be sat in front of ebay trying to bid several thousand ££££s for something we hadn’t seen and didn’t know anything about. And that’s what we did. We actually bid for a bus on ebay – blindly and spontaneously. We didn’t actually have the money to pay for it and we were 150 miles apart debating the amount we should spend via text. We missed out by a few seconds as a late flurry of bids came in. Definitely the right result, but the thrill was good. For a few minutes we really thought we were the proud owners of our first full size VW bus. A week later and we’re down in Southampton looking at our first VW. Carol, the mother-in-law, aka Christmas, Chorley, Gulliver, Devil Woman (harsh but fair) and ironing lady was there too to show her disgust at us being gazumped by a more determined punter. Christmas’ disgust matched our disappointment. It was the same colour as my miniature. On the back of that disappointment we vowed never to return to that part of Southampton again. I’ve no idea where it was but it was a dump of a place and it gave us great satisfaction to know we didn’t live there. By the way – we’re middle class snobs that, in a way, we are ashamed of, but you do get used to the idea quite quickly. That show of patronisation says it all really. August 2009. A week later and Sarah’s at it again. I did tell you she is a ‘go getter’. This time we’ve given up on ebay. (See how I used the term ‘we’). Sarah has found a bus down in Brighton that we have first refusal on. So we trek down there one evening after work to take a look at ‘Bruce’. He’s a sort of orangey mustard colour with tangerine and brown ‘go faster’ stripes down the sides. This and other features such as the pop top and folding table and rock’n’roll bed were introduced to us by Michael, the owner. He’s Australian – the bus, not Michael (he’s English I think) – hence the name Bruce. Not a hint of rust. I think as soon as we saw Bruce we knew we’d found our bus. We paid a small deposit and that was that. Simple. We had our very own VW bus! I’m liking it guys! Definately not doing it in one hit!, but started at the beginning and looking forward to moving along. Like the style & pace and LOVE the van (name TBC). I actually wanted one with your roof, but we have two kids and the Viking is now ‘the only roof for me’. Good stuff.